There are many free and commercial editors available for Python. Here, we will learn how to use some open-source editors to execute Python scripts or statements. IPython stands for Interactive Python. Created by Fernando Perez in 2001, IPython is an enhanced read-eval-print loop (REPL) environment particularly suitable for scientific computing. It offers a fully compatible replacement for the standard Python interpreter, with convenient shell features, special commands, command history mechanism and output results caching. To install IPython, execute the pip3 command which is the in-built Python package installer. 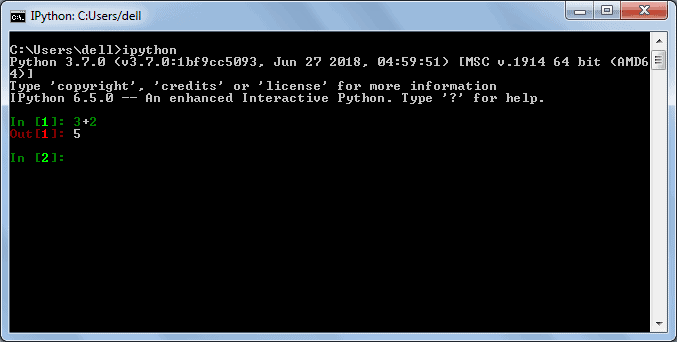 Execute the pip3 install ipython command in the command prompt to install iPython, as shown below. After successful installation, invoke IPython from the command prompt by entering ipython and pressing enter. You can then execute the Python statement as we execute it below in command prompt. By default, the IPython kernel drives the Jupyter Notebook application. However, it supports other languages like Julia and R. (Jupyter stands for JUlia, PYThon and R). 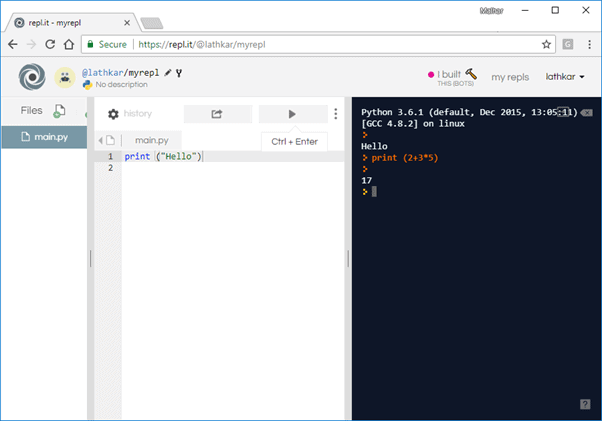 To install Jupyter, use the pip utility shipped with Python software. After successful installation, we can start the Jupyter editor from the command prompt as below. This will open another window to enter python statements and run them as shown below. The interface is similar to IPython shell. However, there are a lot of other advantages. 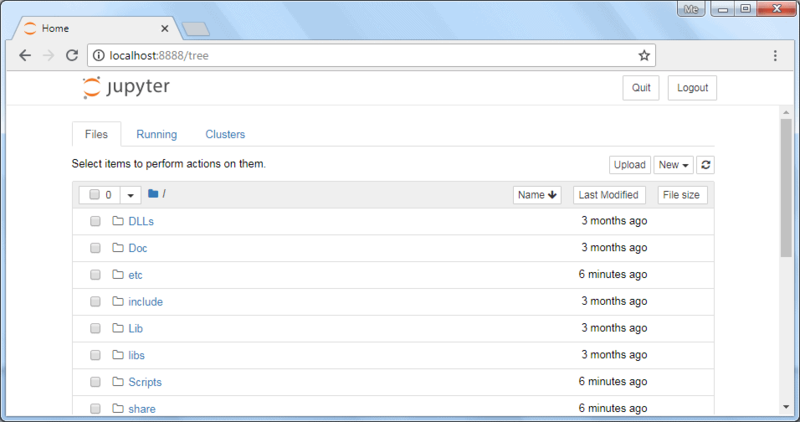 For instance, you can insert and delete cells. A cell can contain code, heading or a markdown text which acts as documentation. The code in any cell can be run. Another advantage is that data visualizations generated by libraries like Matplotlib can be incorporated inline. The notebook is saved with the .ipynb extension. It can be exported to HTML or PDF format so that it can be shared. Many times, Python packages developed by certain third-parties have to be installed while developing Python-based applications. However, requirement for a specific version of the same package may sometimes be conflicting with other applications' requirements. Hence, it is desired to have side-by-side environments for each purpose to avoid compatibility issues. This is achieved by setting up a virtual environment. This will create c:\myvenv and directories inside it containing a copy of the Python interpreter, the standard library, and other supporting files. To activate the environment run a batch file called activate.bat in the scripts subdirectory. The name of the current environment appears on the left side of the windows command prompt. 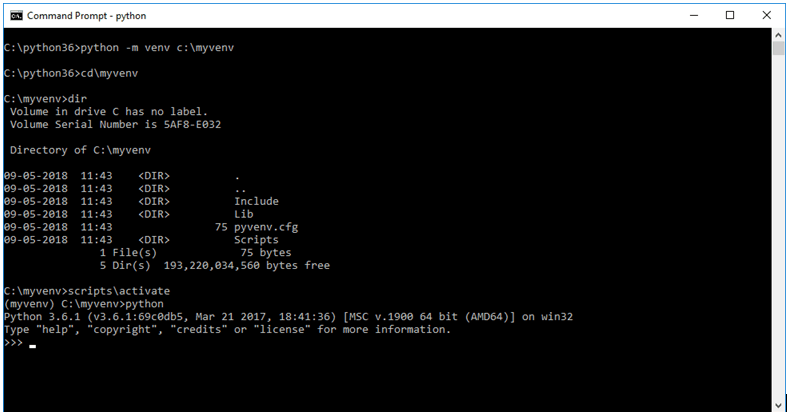 Now you can run a local copy of the Python interpreter from the command prompt. Installing Python (or any software) can be a little daunting for a newbie. Fortunately there are many online resources to get familiar with the syntax, features and philosophy of Python before deciding to install Python in the local machine. You can launch an online Python Shell directly from the official website - https://www.python.org/shell. The Shell terminal shows a Python prompt (>>>) in front of which any valid Python expression can be written, which is executed on pressing 'Enter'. 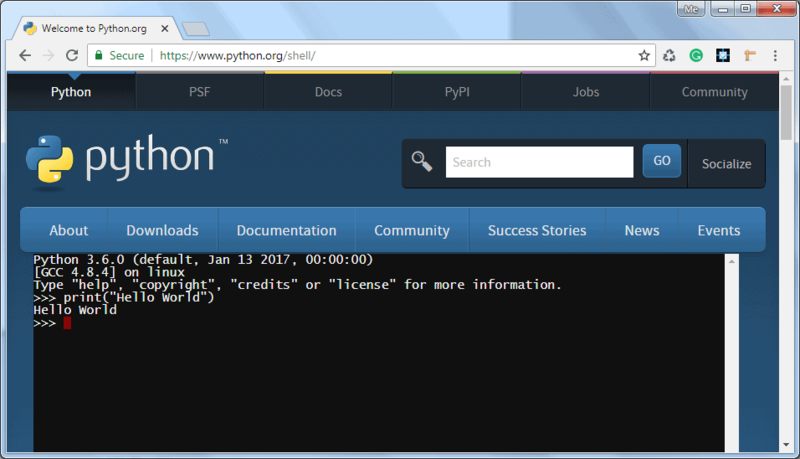 Many interactive Python environment shells can be found on the internet. They work based on REPL (Read, Evaluate, Print, Loop). Using https://repl.it it is possible to execute Python in interactive as well as in scripting mode. The right-hand column in the above diagram is an interactive shell, whereas a Python script can be entered and run in the left pane. Learn about the basic syntax of Python in the next chapter.